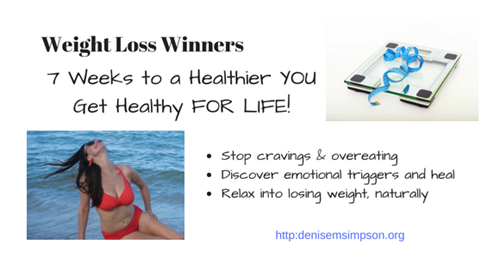 Do you want to be a WEIGHT LOSS WINNER? Are you finally ready to stop emotional eating, stop overeating, bingeing, cravings, or poor nutrition? This 7-week group program is for men/women who are tired of carrying that extra 30 lbs + or more around and want to drop 1-2 sizes. You know you want to be fitter, stronger, or more flexible to be active, healthy, and have fun with family. Group program either in-person or virtually. You'll identify triggers of stress for why you eat, learn healing tools, downloadable recordings, and BONUS - 1 60-minute private coaching session (1 per 7 session program with full pay) to get you on track and on fire to lose what's holding you back. VALUE $150!